Many theaters, particularly LORT theatres, produce a lot of new works (some even exclusively). 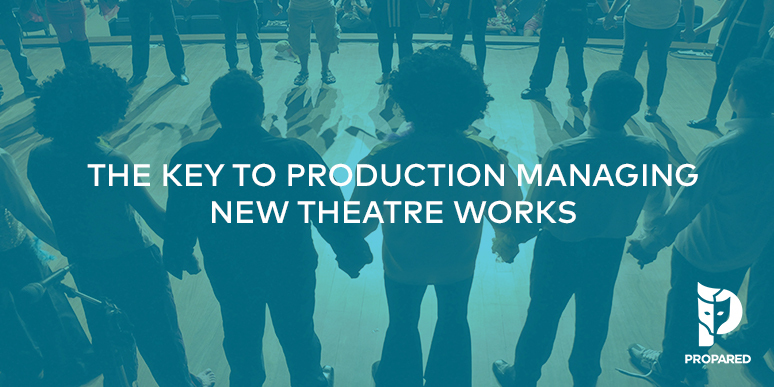 For a Production Manager, there are some major differences in the planning and managing of new works vs. pre-existing shows that we don’t always fully appreciate. Failing to take these differences into account can have some pretty dire ramifications once you’re in the middle of rehearsal and tech. Let’s look at a few key things to keep in mind. This one might sound obvious, but let’s dig a little deeper. Changes will happen with every show, pre-existing or not. But the volume of changes for a new play can be extreme. Every new work will have substantial rewrites. With every rewrite comes new sets and props to build, new numbers to rehearse, maybe even new characters to add! Set aside a much larger portion of your budget for changes (40%-50% in some cases) than you normally would. Build flexibility into your calendar, just like you do your budget (extra tech days, notes calls, and previews). Hire additional crew beyond what you’d normally need. They’ll be coming in for extra calls, and you don’t want the first one to send them into OT. Sit down with each of your department heads. Map out with them the things that are most likely to change so they’re prepared to implement them if (when!) they occur. Make sure your venue budget includes extra time in rehearsal rooms. You never know when the cast will need to go back in to rehearse a new number or scene. One of our most important jobs as Production Management is setting proper expectations so everyone knows what resources they have to work with (time, people, money, etc). We’ve all seen the results of a manager blindly saying “Yes” to every request and then putting the burden on others to deliver. If you’ve planned properly in each department for the expectation of change, coming through at the last minute will be much easier and less painful. But every show has fixed resources and as the PM you need to understand when you’re getting close to those limits. Don’t automatically agree to every new request. Understand the time and effort you’re asking of your crew, designers, and those around you. Don’t be afraid to draw the line and say no to some things. Be clear, honest, and consistent with time and budget constraints. Understand that your expectations are the ones that sometimes have to shift. It’s important to keep an open mind throughout the process. In new works, figuring out new ideas and ways of realizing the creative team’s vision is a huge and exciting part of the process. What seems impossible and ridiculous today may end up as the show’s defining element (landing a helicopter on a stage, anyone?). Most shows have a trajectory that extends pasts the current production. It’s important to understand what these long-term goals are. With new plays, I guarantee the creators will have ideas in mind for next steps. Sit down with them and find out what they are. You’ll need to help them make strong decisions for the current production without sacrificing iterations to come. The ultimate visions of the design team and the director might be better realized in a later production, once the script and score are more solid. These types of conversations can be difficult to navigate as the business and artistic elements can sometimes conflict with each other. For example, let’s say you’re managing a new play in a very large theatre, but it’s slated to start touring immediately after you close. Maybe you don’t design to fill the entire space because you know the show will be playing in smaller houses in the very near future. Producing new plays is not an easy task. Hard decisions have to be made at every step of the way. The more forethought you can put into the process, the smoother things will go (and the better you’ll look!). Break a leg!